After about 10 years of service to the Aldine community, as members of the Board of Directors of the District, Maria Espinoza and Ray Shotwell have announced their intentions to retire this year, when their terms expire. Maria has served as the secretary of the board, and originally was picked to run for the board after serving for 40 years as secretary of the High Meadows North Civic Club. The district was originally known as the Aldine Community Improvement District, a result of an initiative in the Texas Legislature by Kevin Bailey, who helped found the District, getting the original bill to create the sales tax supported district through the legislature in 2001. In addition to retiring from the board, Maria intends to move to the country with her husband. In her parting remarks to the board and guests that had assembled in her honor at a retirement party last Tuesday night at the District’s offices, she said “It has been an honor” to serve the district on the board. Her friends shared her feelings and thanked her deeply for her service and devotion. Ray Shotwell was also honored for the years he had spent on the board, most recently as Vice-Chairman. Ray told the story of originally being asked to join the board and the district by Clyde Bailey and Leland Jauer in the parking lot of Jed’s Hardware store, talking about the prospects of the new district. At the time, Ray was a manager at Brookside Funeral Home, one of the well established businesses in the district and a leader in community affairs. Ray took that leadership role, and his interest in bettering the community, into his role as board member. He presided over the District at a time when its income went from almost nothing, to an average of $3.5 million per year. This money has allowed the district to achieve many of its original goals of providing water and sewer lines, increased police security, street lighting and sidewalks, and other amenities. He saw the district change names from ACID to East Aldine Management District, and now known as East Aldine District. Ray is now retired from the funeral business, although he occasionally helps his wife in some similar business ventures. Ray said that his ten years on the board have been quite an adventure, one that was good for the community and that he was glad to be part of. Executive Director David Hawes and Chairman Clyde Bailey led the remarks of congratulations to the two retirees, joined by others including State Rep. Armando Walle, who recalled and thanked Rep. Kevin Bailey for his work in founding the district and helping it progress over the years. Hawes told the board at its business meeting later, that four positions were open on the board, but that directors Bob Beasley and Gerald Overturff had indicated a willingness to continue another 4 year term. Anyone wanting to serve on the board for the other two terms, was encouraged to contact Director of Services Richard Cantu at 713-595-1220. 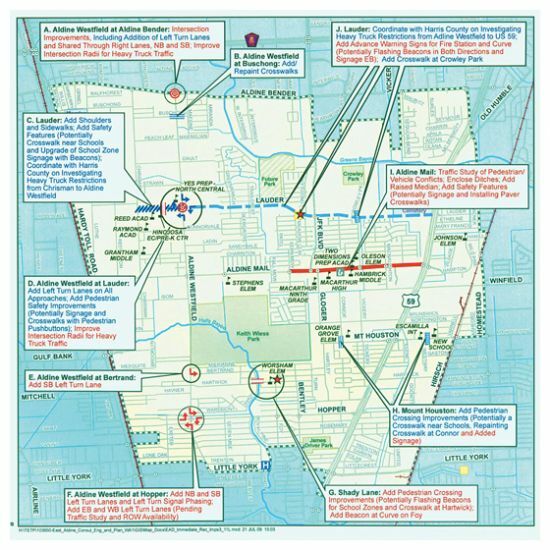 The East Aldine District heard a report last Tuesday night at their board meeting from their mobility and urban design consultants, regarding plans for improvements. Consultants making presentations included Thad Kudela of the landscape firm Kudela and Weinheimer, and David Millikan of the planning firm Wilbur Smith Associates. The improvements come as a result of the recent bond sales. Proceeds from this sale have been set aside for the construction of the following: Trails and sidewalks, $784,000; Signage and monumentation, $1,666,000; Landscaping $2,200,000; and Mobility improvements, $3,837,000. In addition, other monies from the bond sale were set aside for sewer and water improvements in several project neighborhoods. Kudela showed exhibits of improved safety around the schools, with new sidewalks and trails. Next, he showed examples of signage, some directional or informational, and some used for “branding” of the district. New landscaping will be added too, he said, showing examples of trees in medians, starting with JFK. Millikan talked about mobility improvements, including increased turning radii at some intersections that now have large trucks turning, widening of Lauder Road at the intersections, and improved conditions for pedestrians with better crosswalks Many of these improvements are illustrated in the accompanying map. Clyde Bailey thanked David Hawes of HHCLLP, for his work in negotiating a favorable rate for the bond sale that was just completed. Bailey said that the lower rate that was achieved will eventually save the District about $12 million in interest payments over the life of the bonds. During the review of the financial report, it was noted that for the first time since sales tax was collected for the district, there was a slight decline of 1.6% in the total monthly receipts. 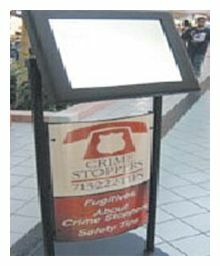 Greenspoint Mall can now boast a new service that no other mall in Texas can claim: a public safety kiosk in partnership with local Crime Stoppers. The new public safety kiosk was unveiled last week at a joint Greenspoint Mall-Crime Stopper press conference. Greenspoint Mall General Manager Ray Bejarano said that the kiosk is one of only two in the nation. The other is in Atlanta. 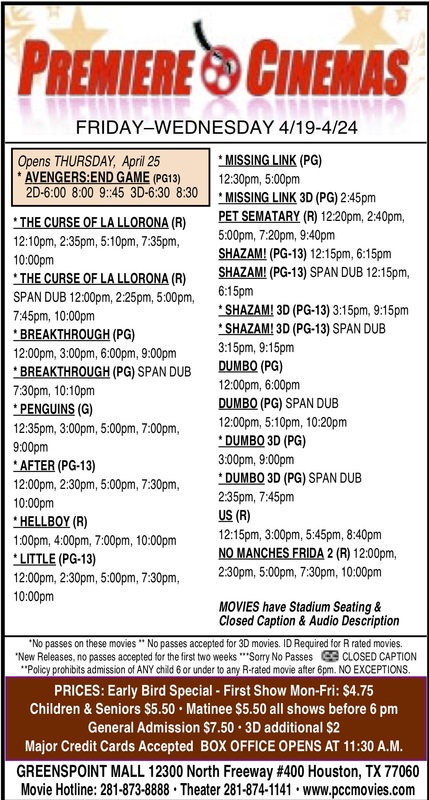 The kiosk is located in the center court area; the part of the mall Bejarano said has the heaviest traffic. The kiosk utilizes touch-screen technology. Bejarano said that with the kiosk, mall visitors can access safety tips as well get a listing and pictures of Crime Stopper’s Top 10 Most Wanted Felons in the Houston area. The site will be updated approximately every two weeks. The kiosk comes from a chance meeting at a North Houston Greenspoint Chamber of Commerce event between Bejarano and Crime Stoppers Executive Director Katherine Cabaniss. Bejarano said that they will be able to monitor how many people use the kiosk during a given time period. If it is well received, he said, he would like to see more installed throughout the mall. The eBook was purchased for $5.50 with the only drawback being it must be read over this computer and one cannot go lie down to read and catch a snooze. It cannot be copied, printed, transferred or forwarded. Like the Vegas theme, “What you read here, stays here”. Our oldest boy by 9 minutes and his clan are down from Pennsylvania. They head back up and across the Mason Dixon Line tomorrow, none too soon for the cats. Must admit the boy has become a good cook over the years and gladly turned the cooking over to him while he was home. Reckon we’ll be eating leftovers for a week after they leave. That is old school maybe but I am sure there are some of you who will agree with me. Took the granddaughters (7 & 12) to Wal-Mart the other morning @ 0600; advised them to stick close to me because somebody might get them and they be making tamales for the rest of their lives. Do not have to worry about the girls running around whooping and hollering like some you see in the stores. Reckon you could say that is why little brother got left behind because I too would whoop and holler too if I had to tag along with two girls in the girl’s britches department. These kids do not know how good they have it. All they did while in Texas sure beats sitting outside in a swing shelling beans and peas, shucking corn and putting stuff up, canning and all. That may be productive and it sure beats watching SQUARE BOB WET PANTS or the Nick channel. Guess that is why they are at their great aunt’s house swimming in the concrete pond and not in the creek outback. Crime Stoppers and Investigators with the Harris County Sheriff ’s Office are seeking information on an Aggravated Robbery at Cupid’s Boutique and Smoke Shop located at 5303 Easthampton near Hwy 59 North. On July 12, around 1:30 in the morning two black males entered Cupid’s Boutique while a third male stood outside of the front door. 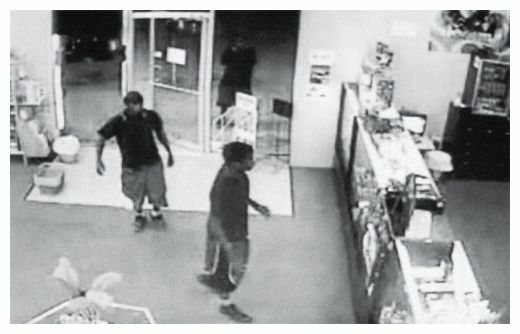 The two suspects produced pistols and demanded cash from the two clerks who were working. One of the suspects climbed over the counter and took money from the cash register. All three suspects then fled the scene in an unknown direction. The first suspect is a 19 to 23 year old black male. He is about 5’5” to 5’7” tall and weighs between 120 to 140 pounds. He was wearing a black shirt with black and gray shorts. The second suspect is a 15 to 16 year old black male. He is about 5’0 to 5’3” tall and weighs between 100 to 120 pounds. He was wearing a black shirt with black and red shorts. The look out was a 12 to 15 year old black male around 5’ tall and between 100 to 120 pounds. The robbery was captured on a surveillance camera. Crime Stoppers will pay up to $5,000 for any information called in to the 713-222-8477 tips hotline or submitted online at www.crime-stoppers.org that leads to the identification, arrest and/or charging of any of the suspects in this case. HOUSTON – Ronald M. Wilson joins NFISD as its new chief financial officer. The North Forest ISD Board of Managers approved Wilson’s appointment at a called meeting Thursday, July 1. Wilson comes to North Forest ISD from Fort Worth ISD, having served as that district’s chief financial officer for nearly three years, where he oversaw a budget of more than $680 million. Board President George McShan said he is impressed by Williams’ experience and background in school finance and is certain he will be an asset to NFISD. In all, Wilson has nearly 20 years of experience in school finance, having worked in accounting and business management for several Texas school districts, including Stafford MSD, Crosby ISD and Galena Park ISD. He also served as the chief financial officer for DeSoto ISD. And before joining Fort Worth ISD, he was, for nearly eight years, the assistant superintendent of budgeting and financial planning for Houston ISD, where he oversaw a budget of more than $2.8 billion. Wilson serves as a member of the Texas Association of School Business Officials Government Relations committee and has served a member of the TASBO Board of Directors and as a member and leader of various TASBO committees. He is also a member of the Association of School Business Officials International, the American Association of School Administrators, the Texas Association of School Administrators and the Alliance of Black School Educators, and has received numerous awards for “Meritorious” and “Distinguished” work in the area of school finance.